Perhaps the most important achievement in cinema history in the 21st century has been the amount we have learned about Japanese cinema during the silent and studio periods. Despite a long-standing acknowledgement of the riches of the Japanese film industry, the lack of English-language scholarship or translation and the inability to view the relatively small percentage of surviving films have been major handicaps. Hence the importance of this book, whose aim is to provide a detailed analysis of the major trends in Japanese cinematography from the silent period dominated by the bright style of Shochiku, through trends within the jidaigeki and into the wartime period where a growing emphasis on low key lighting was legitimised in terms of Japanese cultural traditions. An added chapter at the end extends the analysis through to the widespread diffusion of colour film-stocks in the post-war period as Japanese cinema underwent a second “golden age” based on its newly-won international popularity. It is particularly worthy of note that this book has inspired a retrospective to be included in the 2014 Berlinale. This seems to me to be a tremendously important development for film studies if it signals that academic film historians and film festivals have found a common language and set of interests, and are beginning to talk to each other again. Film academics have been talking only to themselves for much too long. Daisuke Miyao, who teaches at the University of Oregon, mixes close formal analysis with occasional excursions into more broadly cultural analysis. An interest in the historical analysis of the work of cinematographers and the ideas underpinning their work has found its most recent expression in the work of Patrick Keating, who is acknowledged as an influence by Miyao.2 In both the Japanese and Hollywood industries, cinematographers not only made films, but they typically reflected in very self-conscious ways on their craft practice. One of the major achievements of this book is in the way that it makes this new body of material available to English-speakers. This is particularly impressive given that so many of the films discussed here no longer exist, and Miyao does an impressive job of piecing together the influences that underlie aesthetic practice. Each of the four main chapters in the book has a strongly defined theme. Chapter One is based around cinematographer “Henry” Kotani Soichi, who had worked in Hollywood during the teens and was involved with the innovation of “Lasky lighting” in the films of Cecil B. DeMille. Kotani’s failure to find any traction for lower key, psychologically motivated lighting at then-dominant Shochiku gives an indication of the complexity and halting nature of the ways in which Japanese cinema synthesised American influences. Shochiku’s house style was “the bright and cheerful” style of flat frontal lighting that it had inherited from Kabuki and shinpa stage lighting. The second chapter extends this narrative by providing a stylistic analysis of the beginnings of the jidaigeki boom that re-shapes Japanese cinema in the second half of the 1920s. The chanbara is initially more receptive ground for the introduction of low key lighting effects based on the flash of swords. Once again, however, overall generalisations will not suffice and Miyao devotes most of his energies to an analysis of the star persona and films of Hayashi Chojiro. Hayashi’s tremendous appeal to the burgeoning female audience and Shochiku’s continued resistance to lighting its stars in a low-key style resulted in a more complex synthesis of Hollywood’s three point lighting with Shochiku’s flatter Kabuki house style. Miyao does a particularly fine job of describing the interconnections between lighting and performance style in the jidaigekis built around Hayashi’s star roles. Style has a material aspect and Miyao also provides a detailed and nuanced consideration of the impact of incandescent light replacing arc lighting as well as panchromatic film stocks taking over from slower orthochromatic stocks. These are the kinds of details that have provided rich stylistic histories of Hollywood, but have not been widely discussed in a Japanese context. While detailed bottom up analysis of specific films, filmmakers and technologies grounds this study, the author also draws on broader and more abstract topics such as the influences of what Miriam Hansen has termed coeval modernity and the role of the cinema as a technology that foregrounded the visual. There are times when the different modes of analysis do not sit comfortably together, though Miyao does a much better job than most of constructing points of contact between these modes of analysis. The third chapter, dealing with the influence of German-inspired street films provides the most obvious space for the intersection of these modes of analysis. Given the close proximity of theoretic favourites such as Benjamin, the questions about the work of cinematographers temporarily recede in favour of an analysis of Ozu’sThat Night’s Wife (1930) as a Benjamin-inspired commentary on urban lighting. The other issue in the background here is the ability of Japanese cinema to absorb and synthesise influences from a range of international cinemas. Big picture analysis might view this in terms of coeval modernity, but it is also accessible to questions framed in terms of more finer-grained analysis. Stressing international influences in 1930s Japanese cinema stands in opposition, both to Japanese nationalist discourses of the time and also to the way that Noël Burch valorised various stylistic devices from the decade in terms of deep historical links to things such as scroll paintings or Heian poetry.3 The concluding chapter centring on cinematographer Miyagawa Kazuo (who shot Rashomon, Ugetsu and many of the internationally famous works of the 1950s) shows how this process of national essentialising can also be retroactively constructed. Miyao does a masterly job of tracing the ways in which Miyagawa spoke in latter years of the essentially Japanese motivations of his lighting practices, while at the time he was describing them in the trade press in terms of a broad array of international influences. 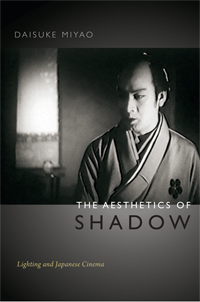 This is a theme that is given its most thorough working through in the fourth chapter in which Miyao arrives at the major study announced at the start of the book: the increasing popularisation of low-key lighting in the late 1930s, which was widely justified at the time as a way of arriving at a distinctively Japanese mode of visual expression. While low key lighting was valorized in terms of nationalism, realism and documentary style, Miyao reads it as a “bending” of stylistic influences inherited from Hollywood. He once again uses a specific cinematographer in order to focus this discussion. “Harry” Mimura Akira had worked with Gregg Toland at Goldwyn in the late silent period. Miyao does a superb job of tracing out the connections between their work and the ways in which Mimura’s practices can be seen as an adaptation of Toland’s sharper deep focus style in the context of a poorer cinema, which lacked the abundance of lighting units and faster film stocks that were such important components of Toland’s developing style. Anyone watching the films of Mizoguchi Kenji or Shimizu Hiroshi from this period would have noted the achievements of deep space and deep focus and sensed that there was a more complicated story to be told than the Bazinian-influenced narrative revolving around figures such as Renoir, Welles and Wyler. Miyao’s work opens up fresh possibilities of a more detailed history that incorporates the work of Japanese cinema. I can only look forward with considerable excitement to the circulation of new archival restorations that will allow us to flesh out the story sketched here. http://filmbiz.asia.com/news/berlinale-focuses-on-aesthetics-of-shadow (accessed November 14, 2013). Patrick Keating, Hollywood Lighting: From the Silent Era to Film Noir. New York: Columbia University Press, 2010. Noël Burch, To the Distant Observer: Form and Meaning in the Japanese Cinema. Berkeley: University of California Press, 1979.